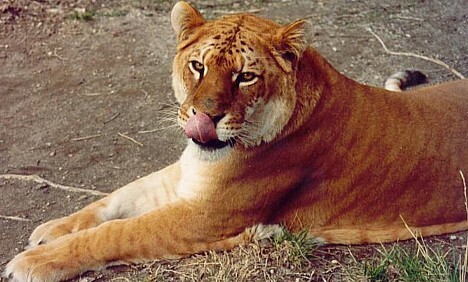 The liger hybrid is more common than the tigon because the mating process is easier. The liger has both stripes and spots. The stripes are inherited from its tiger parent and the spots from the lion parent. 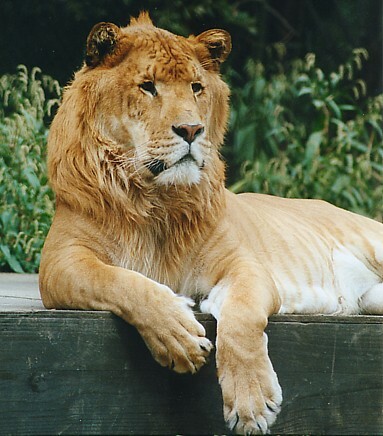 Ligers are usually orangish/golden in color. However, there have been white tigers bred with lions to produce a very light golden coat on the offspring.If the hybrid offspring is a male, it will have a leonine mane,facial ruff of a tiger but it will not be as large and defined as a normal lion's mane.Males and females have spotted bellies an striped backs.male hybrids are usually infertile Some male ligers have more mane development than others and some are almost mane-less,The liger gets most of its strength and size from both of its parents. On their hind legs, ligers stand approximately 12 feet tall. At most, ligers may weigh up to 1,000 pounds.Their highest weight ever recorded is 1600 pounds.Other cat species like tigers and lions are almost half or less than the weights of the ligers. A tiger is capable of reaching 600 pounds of maximum weight. A lion reaches the maximum weight of 500 pounds normally. This makes liger the biggest cat on earth.They are capable of eating more than 100 pounds of meat. However, the keepers and handlers do not want to make the ligers fat. Usually they give the ligers around 30 pounds of meat in one day.On the other hand lions and tigers consume about 9 to 12 pounds of meat in one day not more than that.Ligers make the sound of both a lion and a tiger, although their roar tends to sound more like a lion's roar.A liger is capable of achieving a maximum speed of 50 - 60 miles per hour.The exact numbers of ligers are near to 100. The lifespan of ligers, as well as other hybrid animals, is shorter than a normal species. The animals seem prone to cancers and other illnesses. Female tigons and ligers have often proved to be fertile and can mate with a lion, tiger or in theory with another species such as leopard or jaguar. Tigons and ligers have been mated together to produce ti-ligers (tig-ligers). Tigers and tigons have been mated to produce ti-tigons. Ti-ligers and ti-tigons are more tigerlike (75% tiger). Ti-tigons resemble golden tigers but with less contrast in their markings. 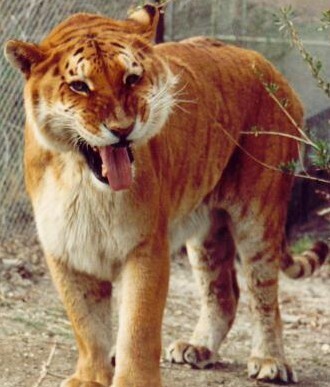 During the late 1970s/early 1980s, the Shambala Preserve had both a tigon and a ti-tigon. Noelle, the tigon, was born in 1978. Believing that big cats are always infertile, staff allowed Noelle to share an enclosure with a male Siberian tiger called Anton. In 1983, Noelle produced a ti-tigon name Nathaniel. Being 75% tiger, Nathaniel had darker stripes than his mother and he "spoke" tiger rather than the mix of sounds used by his mother. Being only 25% lion, Nathaniel did not grow a mane. He died age 8 or 9 years old due to cancer. Noelle also developed cancer and died soon after. It is possible that the mix of genes contributed to the illness. Tawny, golden and white forms. Popular in Japanese zoos and also bred in Italy. Leopard x tigress seem more likely pairings. I have read only one report of supposed tigard hybrid, but the Dogla is a supposed natural hybrid. Visit The Tiger Territory: Liger-Tigon And Other Hybrid Info. Also Visit Hybrid Big Cats,By Messy Beast. Pounce There!